You must be a NeTTwork partner, a trained pro player, have attended a WOFS seminar or purchased our Home Study Course (HSC) to use our exclusive patented Tri or Super BET GENERATOR. With the BET GENERATOR you can generate trifecta or superfecta bets and print each in color in less than a second. 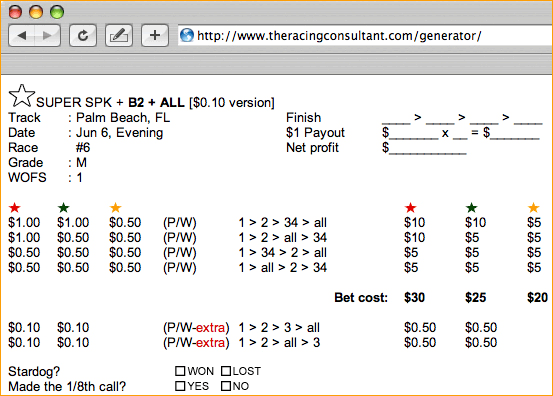 This is not a software program used in the handicapping process. Our BET GENERATOR is a helpful and an extraordinary program giving you to the most profitable bet to make once you have handicapped your race using the WOFS Speed Method and makes the transfer process of your tri or super bet MUCH easier and faster! My pro players also register for secure password access to private areas of our website. These areas include our Bet Generator. With our "exclusive" Bet Generator my pro players generate [Trifecta] or [Superfecta] bets and print each in color in less than one second. 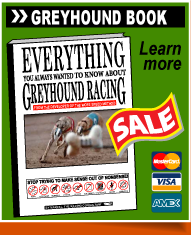 However, this special dedicated software is not just about speed printing your bet. It's also about accuracy and making sure that you have played every combination using a properly structured bet. My Bet Generator is an extraordinary tool giving my pro players the most profitable bet to make once they have handicapped their race using the WOFS Speed Method. 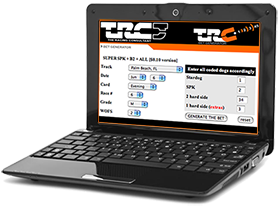 It also makes the transfer process of their [Trifecta] or [Superfecta] bets easier and faster. There's always a risk of missing certain combinations if you "hand write" your bets. Or, placing the wrong bet amount on one of the combinations. But, when using our Bet Generator you never have to worry about mistakes. The Bet Generator is not a software program used in our handicapping process. It is a easy to use wagering tool to help you structure your [Trifecta] and/or [Superfecta] bets. Prior to the development of Bet Generator our players had to write up or type out their bets at each level and mistakes were inevitable. Bets were not as well structured as with the use of the Bet Generator. It has become an INVALUABLE tool for my players. In closing this section, when setting up your [Trifecta] and/or [Superfecta] bet our Bet Generator requires "your input" to be correct. This is good news if you are one of my trained pro players because your "input" would be based on your handicapping expertise learned by using WOFS. Obviously, if you are not one of my trained players you do not have access to this betting tool. As you can see by the way we structure our trifecta and superfecta bets (in the example shown in this section) when using WOFS we ALWAYS use our STARDOG on top in all combinations. So, even if you paid a programmer thousands to design a similar Bet Generator of your own, it would not help you one bit unless you are able to pick winners at the rate of 50% (which is 17% above expert level) as my players do. Some of my player run a win ratio of 60% and higher! In fact, all your bet generator "copy" would do is lose even MORE money for you since you need to know the winner of the race to profit. So, the message here is obvious! Learn to play on a Pro level from a proven professional first! Then worry about the betting. After all, what good is betting if you can't pick winners consistently?